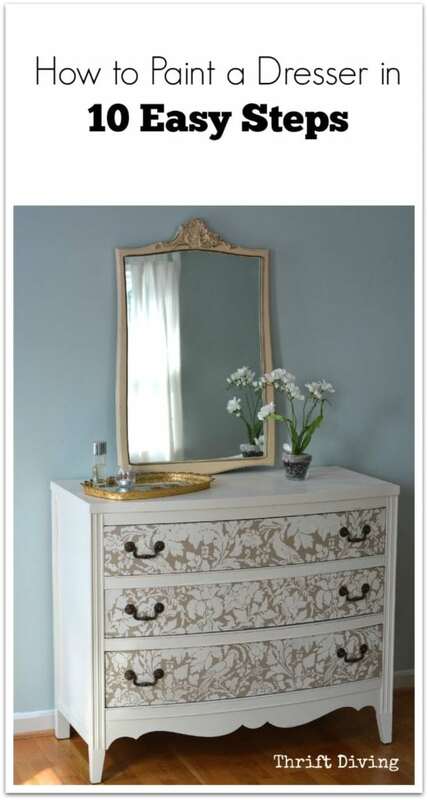 You are here: Home / Furniture Makeovers / Dressers & Buffets / How to Paint a Dresser in 10 Easy Steps! If you’ve got a spouse who complains about the amount of furniture you’ve got hoarded up in the garage, basement, spare bedroom, etc. go show them this post. Seriously! I’ll wait. [Insert Jeopardy theme song here]. They’ve got to see this because it’s the perfect example how buying the right piece of furniture and then storing it for obscene amounts of time is totally worth it. Because one day, you’ll finally get to it. And when you do, it will be worth the wait! 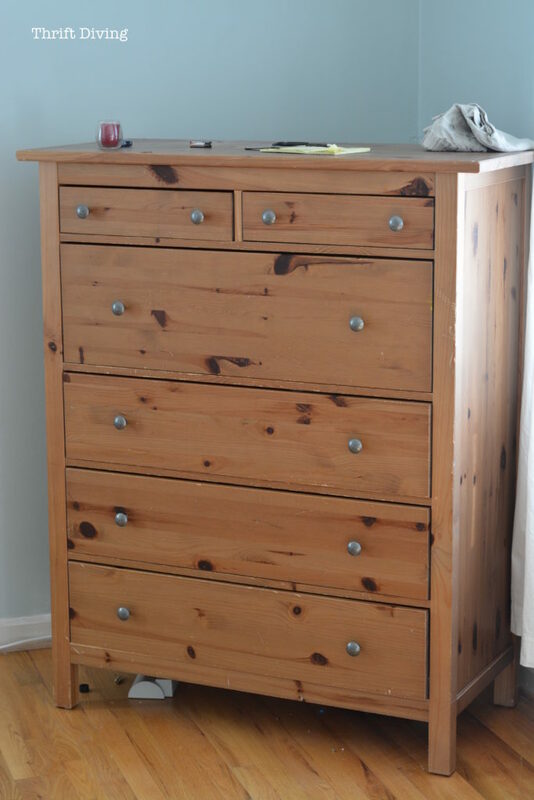 I’d found this dresser at the thrift store in January 2012. Yes, for three years it’s taken up real estate in my garage, annoying my husband with the clutter. Here’s what it looked in its “before” state. Last week I FINALLY had time time to paint it and make it a pretty place to house a lot of my clothes! This is my least favorite part of painting furniture. You just want to dig in and get started! But you have to clean it first, or the paint won’t stick. Plus, no one wants to use furniture that’s all dirty inside. Prepping shouldn’t take any more than 15 minutes or less! If you’re using the right paint, it’s nearly impossible to mess up. Generally, I use chalk pai because it’s so smooth and goes on well in two coats, but RECLAIM Beyond Paint sent me some samples to do this piece (for this dresser, I used Off White and Linen). I’d used the paint before on this thrifted china cabinet and was interested in trying it again on this dresser. STEP 2: Where Ya Gonna Be Painting? Not everyone has a studio, basement, or garage where you can bang out projects. You might have to paint inside your house. That’s okay! The awesome thing about all brands of furniture paint nowadays is that they’re either no VOC, low VOC, or very low VOC. Now, don’t get me started on explaining VOCs (volatile organic compounds), but this site explains it so well, why invent the wheel? 🙂 But it’s the bad stuff that used to be in many paints that was harmful to you and the environment. Many latex-based paints today are low VOC, but check before using them. Most furniture paints, however, are at least low VOC, so you don’t have to be worried about using them inside or with children near. There are tons of furniture paints on the market now (click here to see What’s the Best Paint for Furniture?). Seems like everybody and their mama has come out with a furniture paint! That’s good for us creatives, but it can also be confusing because you don’t know which paint to select. They’re probably all just fine, but some are good for beginners. Don’t ruin your floors. I know it sounds very common sense, but I only include this because I have ruined some floors by trying to take the short cut and not cover the floor (umm…laziness??). Try plastic drop cloth, towels, or newspaper or something similar. Dressers are gross. 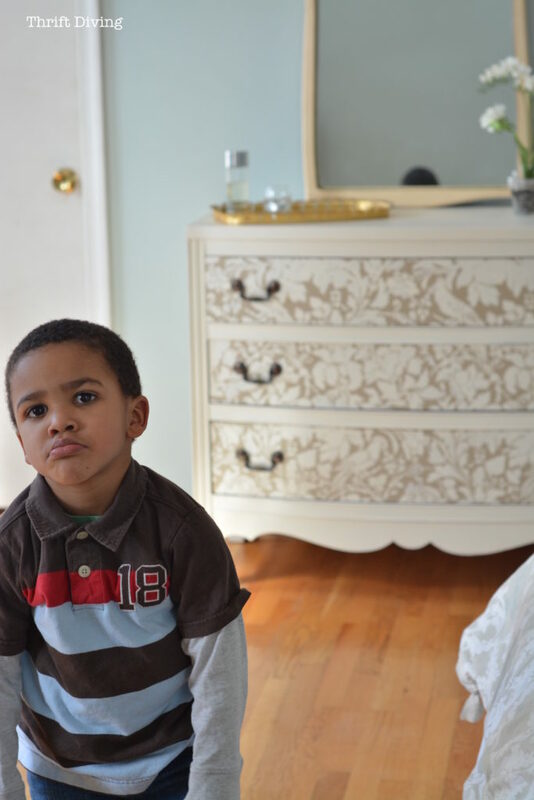 Wait, let me clarify that: thrifted dressers are gross! LOL. You’ll need to remove the drawers and use a solution of vinegar and water and wipe everything out. Try using a steam cleaner (I recommend the HomeRight Steam Machine) to get the deep down gunk out of the dresser. You can find a full video tutorial HERE for all of the Steam Machine’s uses, plus see how I used the steam cleaner to blast those dirty thrifted file cabinets I used in my basement home office DIY desk. STEP 5: You Better Test It First! 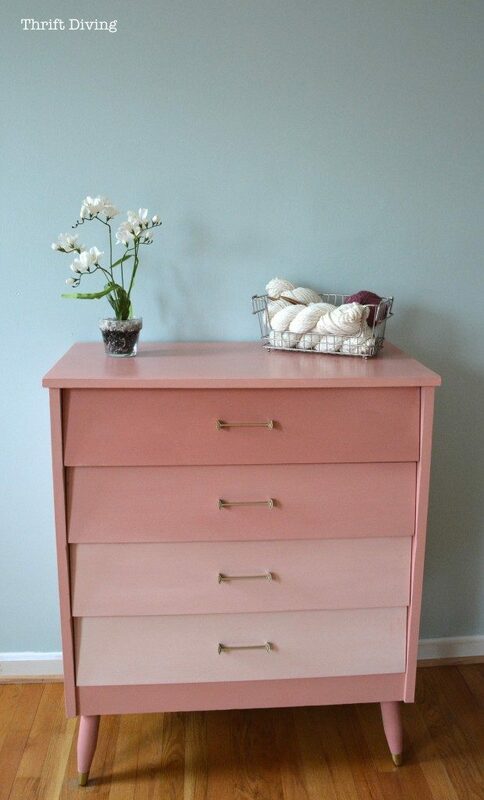 I had planned on painting the mid-century mod dresser white, but when I saw what was happening, I decided to paint it pink to disguise the bleed. It worked in my favor! The outcome was pretty! If you run into this problem, I’ve been told that an oil-based primer (try Kilz brand) with 2 coats should cover the bleed. Be sure to let it dry completely in between the two coats. Then start painting! I plan to do this with the next “bleeder” I paint! STEP 6: Now You’re Ready for Paint! 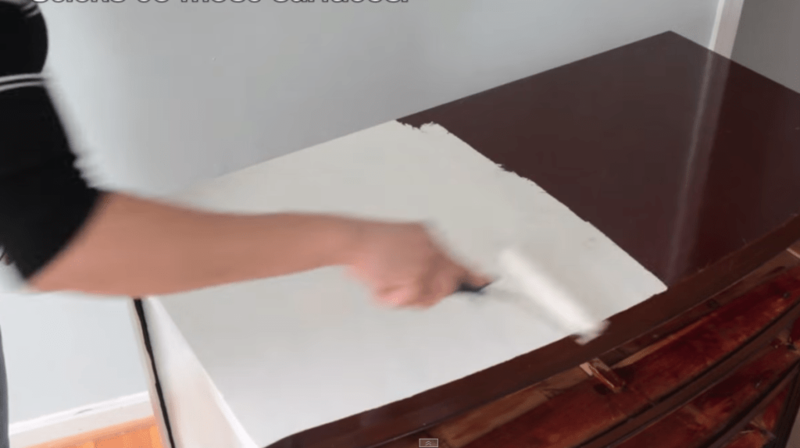 Some people like to use a roller, but I love using a brush or a paint sprayer (watch this video tutorial on how to use chalk paint in a paint sprayer). 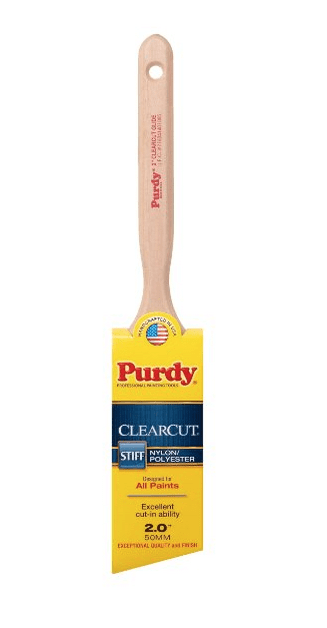 If you’re using a brush, try my favorite, the Purdy brush. They come in various sizes. I have a few in different sizes for different projects. Its angled bristles are so smooth and won’t fall off onto your wet finish! If you decide to use a roller, get one made for smooth surfaces. STEP 7: Don’t Forget the Insides! 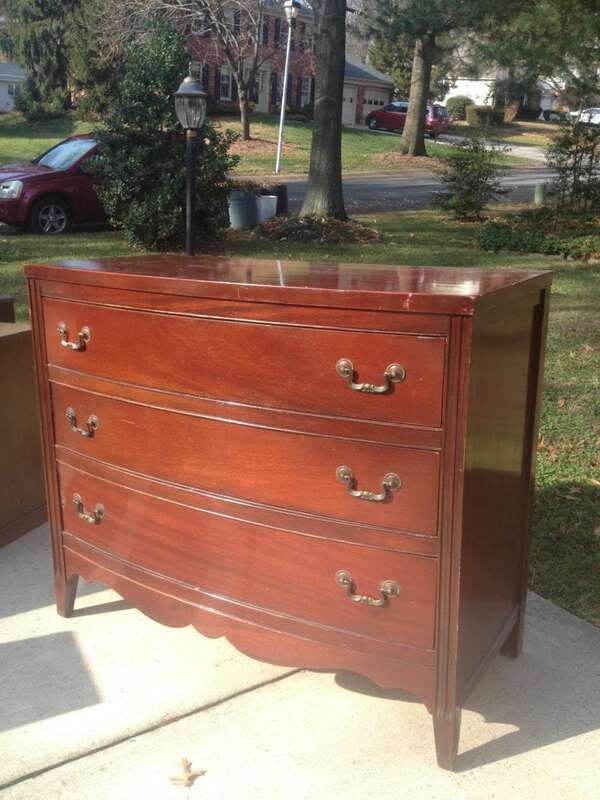 What point is there to have a pretty dresser, only to open it up and see “ugly” inside? Paint the inside of the drawers, and the sides, too. And while you’re at it, do the back, too. It just makes a piece feel more finished. 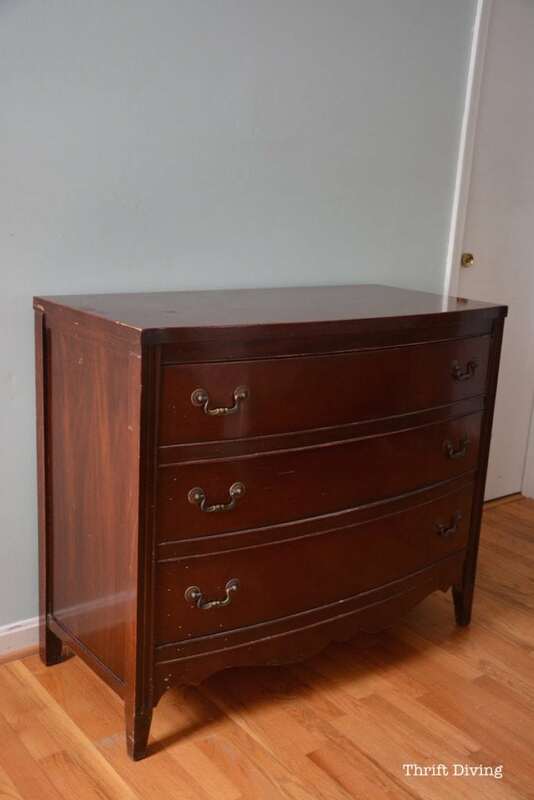 Don’t feel like you have to paint the inside of the body–I’m talking the deep bowels of the dresser. No one will see inside that part :). Here’s the truth: as good as most furniture paint is, most of the brands will require you to paint two coats. Well…..not require….especially if you’re going for a look that’s more blotchy. 🙂 But if you want even coverage, plan on two coats. Be sure you let the paint dry in between coats. 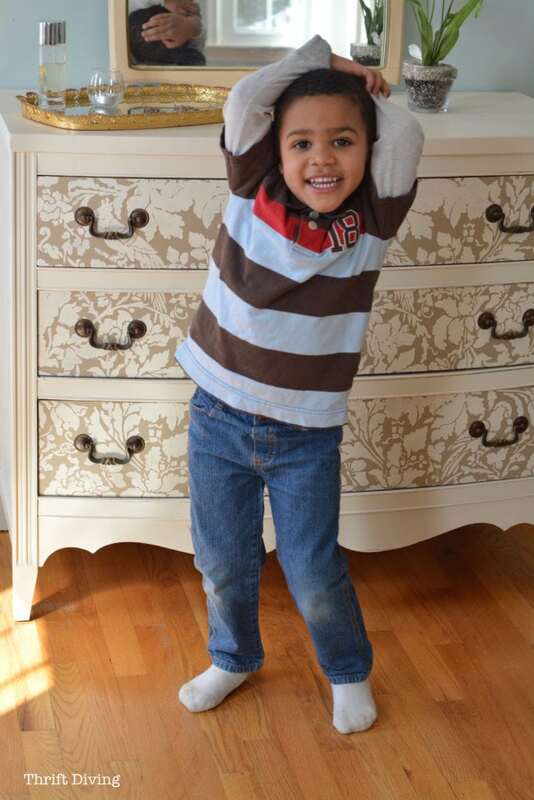 Some paints suggest 2-4 hours drying time in between, but I know with Annie Sloan® chalk paint it dries super fast. I’ve done second coats in about 1 hour. If you’re just painting a basic coat, don’t worry about any special technique. If you’re old enough to remember Danielson from The Karate Kid, you simply “paint the fence.” LOL. It’s that simple. 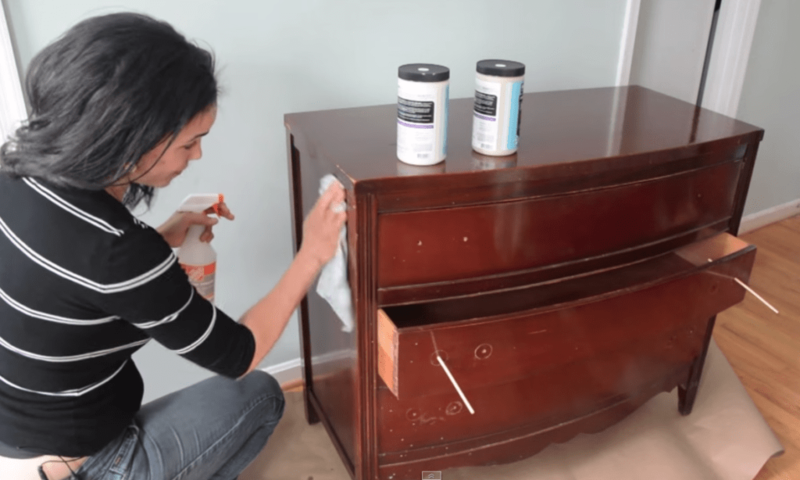 If you’re using the chalk paint, the thicker the paint, the more brush strokes you’ll see on your dresser, which may be the look you’re going for. If you mix in a teeny bit of water to thin out the paint, it will go on more smoothly and evenly without as many brush strokes. Depends on the look you want. Play around with it on a sample piece if you’re nervous about “ruining” your good piece. STEP 9: Give It Some Pizazz! I love stencils. 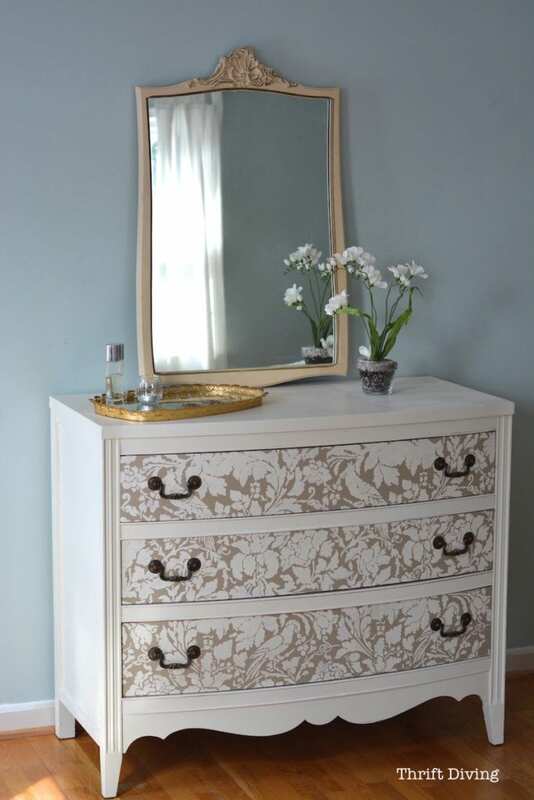 They’re the easiest way to jazz up a piece of furniture with just stenciling on the drawers or the whole piece (watch this video tutorial on how to use stencils on furniture). 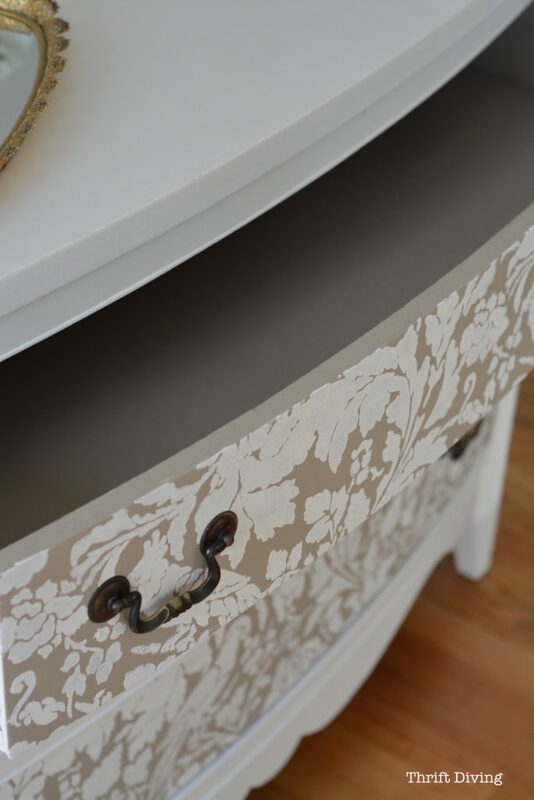 Once the paint is dry, feel free to add stencils, or you might want to glue fabric to the front of the drawers (watch this video tutorial on how to glue fabric to wood drawers). You might want to change the knobs or handles. There are tons of options at places like Hobby Lobby. I’ve heard that Home Goods is also selling cute knobs for super cheap. I would check them out first! But don’t feel like you have to change the hardware! Sometimes the original just works. 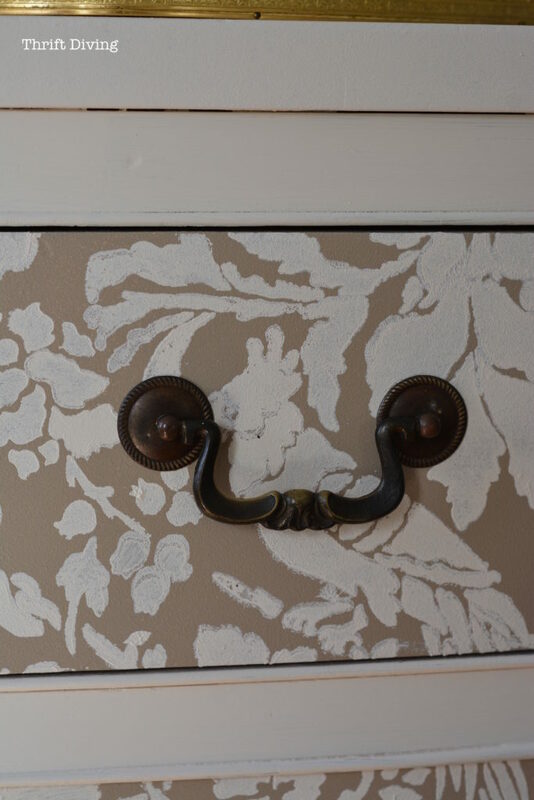 I love these handles on this dresser and decided to leave them “as-is”! (READ: less work for me!! Double win!). For more info about the stencil I used, check it out HERE. 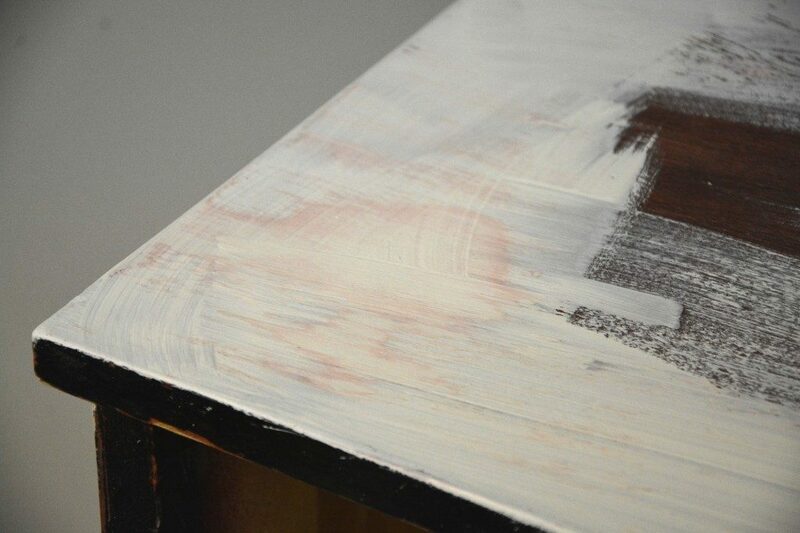 Since I used RECLAIM paint for this dresser, which is self-sealing, it doesn’t require a sealer. I would have used a sealer if it was a heavily used piece like a coffee table or something. But ain’t nobody but me using this ‘ole dresser :). The self-sealing factor should be fine! If you’re using another brand of furniture paint, ask what sealer is recommended. And that’s it! It’s really very simple to take a piece of old furniture and totally transform it into something amazingly beautiful for your home without spending a lot of money! This is what I had been using for my clothes: a cheapie from Ikea that we bought 13 years ago. (EEK!!! Ikea lasts that long???). Hubby had most of the space, and I have my stuff crammed into the bottom drawer (not to mention it’s totally boring!!). But now, I’ve got a beautiful dresser all to myself! Mirror……$15 from the thrift store. 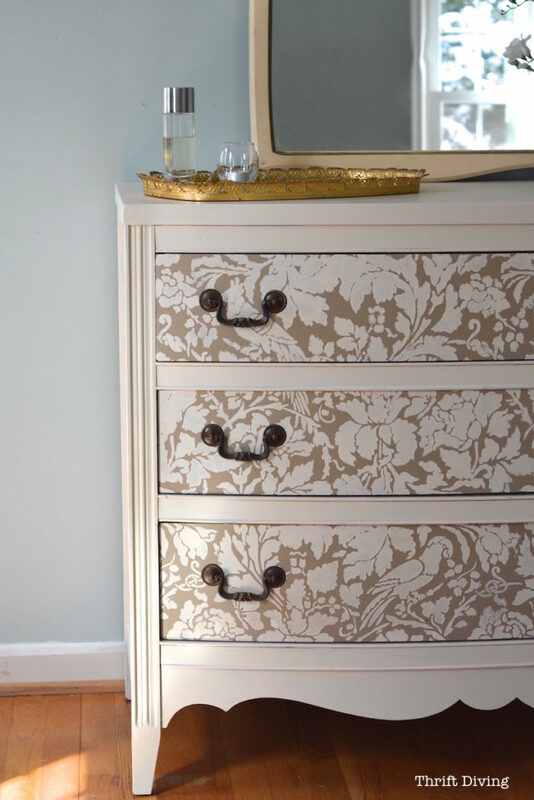 So do you have an old dresser you’ve been wanting to jazz up? Leave your comments and questions below and add to the discussion!